Perfect inspirational birthday toasts have a knack of speaking directly to the heart and soul of the birthday boy or girl. That's exactly what the birthday messages on this page can do for the ones you love on their birthday! Be sure to choose a toast below that comes closest to your outlook on life and, if you feel it's not close enough to how you feel, personalize it with your own inspirational messages. If you make a toast you don't believe yourself, it will show. Think you need some tips on choosing the best inspirational toast for the birthday boy or girl? Yes. 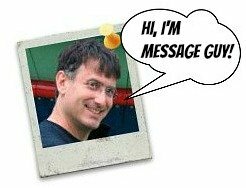 Well, then, click here to read Message Guy Tip #58. And if you need some helpful hints on actually giving a toast, find out how to deliver the perfect toast right now. May you have the luck of the Irish, the joy of a child and the peace of an angel...today and every tomorrow you are fortunate enough to have. Happy birthday! You've given me the greatest gift one person can give another: unconditional love and acceptance. And, by doing so, you've shown me to give this gift to others, even when they cannot or will not do the same. Happy birthday! I love you and I accept you! 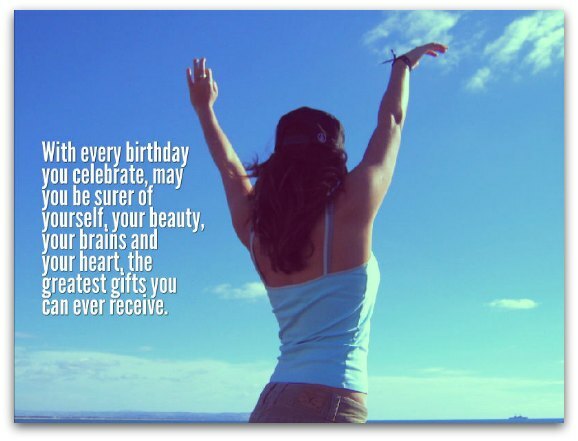 With every birthday you celebrate, may you be surer of yourself, your beauty, your brains and your heart, the greatest gifts you can ever receive. Happy birthday! Here is a toast to every beautiful year of your life, during which you have spread so much joy, so much beauty and so much love to so many others. May you live to be a hundred! Happy birthday! Now that you’re one year older, do not feel bitter about it. Many are deprived of this precious gift. Have a truly happy birthday. On your birthday, I offer you the words of Joseph Campbell: "Find a place inside where there's joy, and the joy will burn out the pain." May you only know burning joy. Happy birthday! The inspirational toast you need is here. I have a few words to share with you, which are all the more poignant on your birthday: Your present circumstances don't determine where you can go — they merely determine where you start. Your birthday is a great place to start. Happy birthday! You may be a year older but that shouldn't stop you from doing anything. As C. S. Lewis once wrote, "You are never too old to set another goal or to dream a new dream." This from a man who brought us Alice in Wonderland, so keep dreaming the good dream! Happy birthday! For your birthday, I have Emile Zola's words of wisdom for you: "If you ask me what I came into this life to do, I will tell you: I came to live out loud." May you live so out loud that you drown out the naysayers in your life and only hear the sweet music of your own song. Happy birthday! Today, I'm reminded of what writer Edith Wharton once said, "There are two ways of spreading light: to be the candle or the mirror that reflects it." You're both, my friend. May your guiding light shine so bright that it keeps you and all you love on the path to love, peace and glory. Happy birthday! Ralph Marston once said, "What you do today can improve all your tomorrows." So what we wish for you today could come true tomorrow. Wishing you a happy birthday and an even happier life! This beautiful, gracious, kind and funny woman is so unique that I don't know where to start about her. What I will say is that her specialness inspires everyone who knows her. And it makes us love her all the more. Here's to our birthday girl. Happy birthday! Whenever I've been down and out, your words have always made me stand tall. As you travel through your life, may you always hold your head high and if, to coin the words of Winston Churchill, you ever find yourself going through hell, just keep on going and you'll soon see daylight. Here's to you. Happy birthday! It's been said that the greatest pleasure in life is doing what people say you cannot do. You must be one happy camper, because you have always astounded us with your truly amazing exploits. May you only know success and joy with every incredible feat you accomplish in the future. Happy birthday! May you all your wishes come true but one, so you'll always have the passion that comes with something to strive for! Happy birthday!